Infants and toddlers are people on the move! They use their bodies as tools for discovery. We see them wiggling, reaching, creeping, crawling, scooting, cruising, walking, dancing, and even running. These are some of the ways infants and toddlers demonstrate their “gross motor” or large movement skills. We also see them wiggle their fingers and toes, grasp objects with their hands, and pick up tiny objects with their fingertips. These are considered small body movements, often called “fine motor” skills, which also include oral motor skills. We see infants develop muscle control in their mouths as the sounds they make change rapidly from cries, to coos, to babbles, and eventually to words. 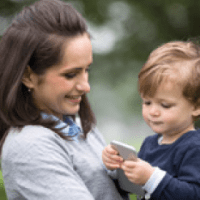 One reason many families connect with the early intervention program is that they have concerns about their child’s motor development. Families may worry that their child is not reaching milestones or moving in a typical manner. It is important to remember that each child follows an individual timeline in meeting specific motor milestones. 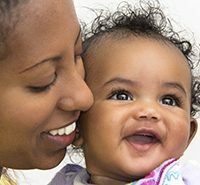 Because of these individual differences, caregivers may find it helpful to know three key ideas that explain the progression of motor development of infants and toddlers. Motor development starts at the head and moves down to the toes. Newborn infants do not have control of their heads. They first develop control of their head and neck muscles and develop the ability to hold their heads up and look around. Next infants develop control of their core muscles and arms (trunk) as they learn to roll and sit up. When these core muscles are strong, they develop more control of their legs as they learn to pull to a stand, walk with support, and eventually walk unassisted. Motor development starts from the center of the body and moves outward. Initially, infants move their limbs in an uncontrolled way, often because of their primitive reflexes. To progress in development, these innate reflexes must disappear first. As they mature, they begin to move their limbs intentionally. First, they make larger movements with their arms and legs, and as they mature, they will start to develop the small muscles of their hands, feet, and mouths. Motor development is first general and then becomes specific. This means infants will first use their large muscles more generally, and as they grow they will develop more precise motor abilities. For example, as infants begin to get control of their limbs, they make swiping movements at toys and objects. Over time, they develop the ability to grasp objects in their palm and then eventually to use the tiny muscles of their fingers to pick up small objects such as small pieces of fruit or cereal. These big ideas about motor development can help you understand the progression of motor skills you see your child display. Think creatively and consider your everyday routines. You can support your child’s motor development by providing opportunities for her to move and discover the world. 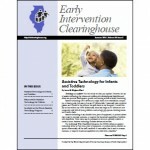 If you have more questions, talk to your service coordinator or early intervention provider. We have all seen it: Young children are fascinated with the box or wrapping paper from a gift more than the actual gift. Maybe they are onto something. Many of the items that are lying around the house can be great toys for young children. From boxes and baskets to scarves and dishes, these items are at our fingertips and can encourage infants and toddlers to move around the room. Young infants benefit from lying on a soft blanket on the floor. You can engage an infant by lying next to them and letting them turn their head or reach for your face or hand while you talk or sing to them. Tummy time—done only while the baby is awake—is also important at this stage to develop neck and shoulder muscles and control. With close supervision, you can encourage a child to reach for a toy or begin to move around. As infants develop stronger neck and shoulder muscles and control, they will begin to use their arms and legs to move around. Rolling around the room becomes an efficient method to reach desired objects. Once a child has developed trunk control, he can move from lying down to sitting and later to crawling, standing, and walking. At birth, a baby’s hands are clenched as the result of a reflex she is born with. She will soon discover her hands and then her feet and toes. Later, she will be able to open her hands, reach for objects, grasp small objects, and bat at toys. Once a child can hold an object in each hand, she will enjoy banging them together to make noise. She will soon begin to grasp smaller objects with just her thumb and pointer finger. Be prepared for her to pick up small crumbs or other objects from the floor. Keep a close eye on her because she will likely put those items in her mouth. Young children are captivated by looking in the mirror. Many toys have small mirrors built in, but a low wall mirror allows infants to notice themselves while on the floor, a mobile infant to roll over to it, and a toddler to explore the concept of body parts (eyes, nose, teeth, etc.). Boxes provide endless opportunities for play. Younger infants might explore a small box by banging on it or opening and closing it. He can climb in or through a larger box and place objects inside it and dump them out. Objects begin to take on a purpose for older toddlers and 2-year-olds. A large box might be a house, cave, or tent, while a smaller box could be a hat, drum, or car. An appliance or electronics store is a good source for large, sturdy boxes, while shoeboxes and tissue boxes can be fun smaller toys. Safe objects to throw might include rolled up clean socks, shower puffs, or pot scrubbers. These can be grasped easily by young infants, used for filling and dumping, or safely thrown into boxes or baskets by older toddlers. Shower puffs and scrubbers can also be great props for water play and exploring the concepts of size, shape, color, and texture. By placing these items just out of your child’s reach, he will need to figure out how to reach that item. Common household items—mirrors, boxes, and even sock balls—can provide you and your infant or toddler with hours of exploration and fun. Enjoy these motor moments all around you! What’s the Difference Between Physical and Occupational Therapies in Early Intervention? Many people wonder what the difference is between a physical therapist (PT) or an occupational therapist (OT) working with babies and small children. It often looks like the same thing. The difference really depends on the age of the child and the child’s motor skills. All children need to develop their bigger muscles first in order to hold their heads up, roll, sit, crawl, and walk. Until a child is sitting, both PTs and OTs do a lot of the same thing. We work on head control, purposeful reaching with hands, rolling over to get to toys, and sitting. Once a child is sitting, then we start to see a difference. The PT will work more on the use of bigger muscles with an emphasis on transitional movements, such as getting into and out of a sitting position, getting onto hands and knees, pulling to stand, sitting to stand, and then walking. The OT will work more on how children are using their hands to explore and play and how to manipulate toys to play as well as sensory experiences such as how things feel and how well the child can tolerate different textures. Each therapist will try to incorporate activities that the other therapist is working on so a child gets more practice at different skills. For example, a PT will work on going from sitting to being on hands and knees and back to sitting by placing a toy just out of reach. An OT may use the same toy because it has a texture that is unfamiliar or needs to be activated by pushing a button or twisting a knob. Once the child reaches the toy, the PT works on having the child play with that toy for a while before moving the toy again or changing to a different toy. Both therapists will look at whether a child needs adaptive equipment to play, sit, stand, or walk.